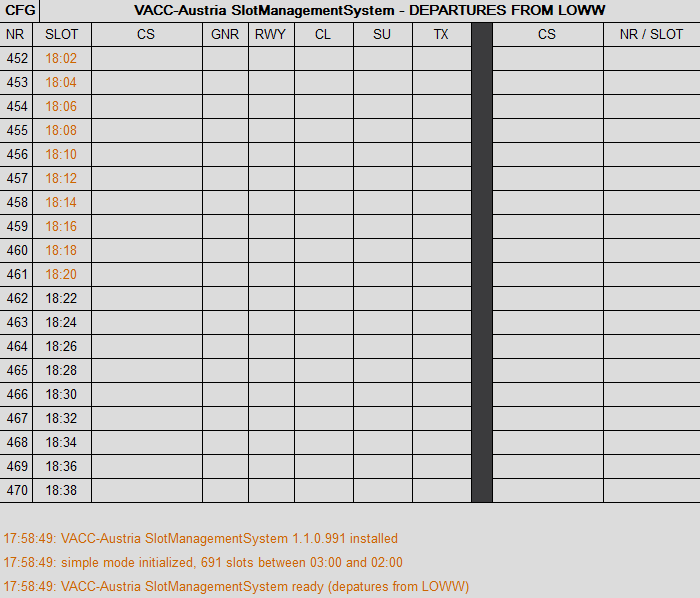 The VACC-Austria Slot Management System Plugin has been designed to help controllers keep track of slots during events. It provides a list of slots and associated times and of aircraft at and around the airport. The information one controller enters into the system is communicated to the controllers around them such that they all have the same information available. The plugin comes with two modes: Simple and Event. Slot Information is provided via a text file that can be downloaded by VACC-Austria members in the SMS Plugin-Area. To use the current version of the plugin you need to have Euroscope V3.2 installed. The current Version of the Plugin can be found in the SMS Plugin-Area (login required). Copy the files SMS.dll and SMS_Default.asr to a location of your choice. Some may need to install Visual C++ Redistributable for Visual Studio 2012 which is packaged with the Plugin or may be downloaded from here. The plugin should now be listed in the list of plugins. Click it again and make sure that SMS View and, if you want to use the SMS TAG items, Standard ES Radar Screen are listed unter Allowed to draw on types. The settings of the plugin can be changed in the CFG dialog that can be opened by clicking on the CFG or by directly editing the ASR file used. 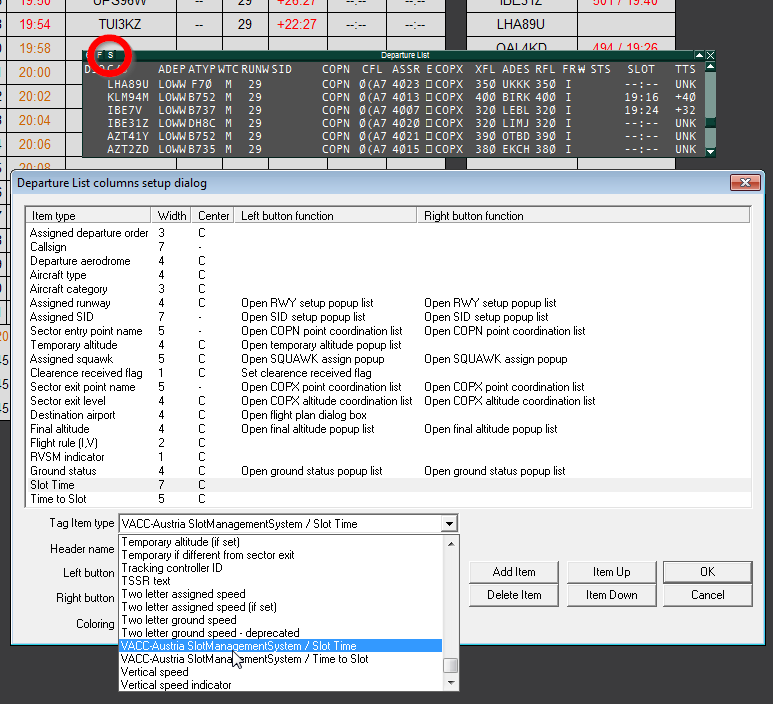 There you can switch between DEPARTURE and ARRIVAL view, change colors and adapt various other settings to your liking. Also you can chooose between the methods slots are inserted into the system. Local - Event slots and bookings are loaded from a local file that is specified in the ASR file. Server - Event slots and bookings are loaded from the web. Event - If there is an upcoming event that uses slots and the slot booking period has passed, it will be shown here. Otherwise only the Simple Mode is available. Local Folder - When using Server mode to retrieve slot information, necessary files will be save to this folder. Once you have set the right settings, download the file and open it via the Open SCT → Open ... dialog. More advanced options can accessed by editing the ASR file directly and they are also documented in the files that can be downloaded from the VACC-Austria homepage. Slots can be assigned by dragging an aircraft callsign onto the desired slot, either from the waiting aircraft list, or from another slot. The information one controller enters into the system is relayed to the other controllers using the scratchpad of the respective aircraft. In order for this feature to work, all controllers need to use the same configuration of the slot plugin. Time to Slot - Time difference to the slot in minutes. Negative numbers indicate slots that are in the future, positive numbers indicate that the slot time has passed. These items can be used both in lists, to which they can be added by clicking on the S symbol, or in tags that can be edited in the Open SCT → TAG editor ... dialog. This guide has last been updated for SMS Plugin V1.2 for Euroscope V3.2. If you get a message "Failed to load plugin DLL", make sure that you have Visual C++ Redistributable for Visual Studio 2012 installed. 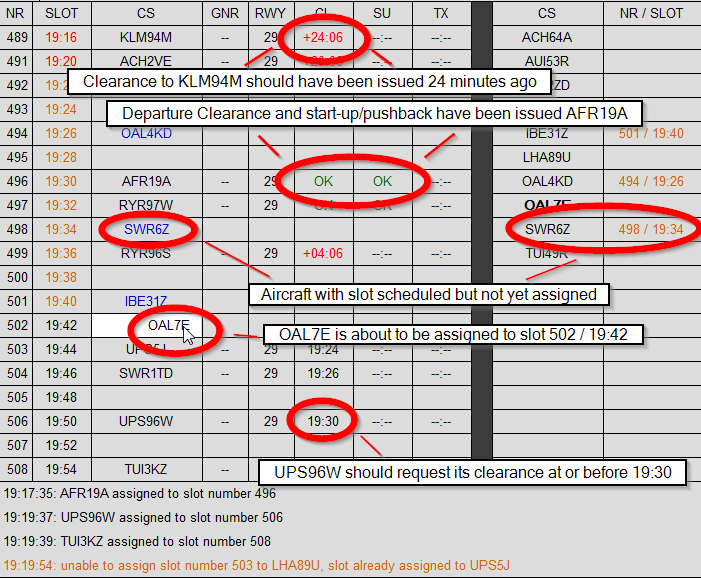 Opening multiple ASR files can lead to incorrect display of slot times in TAGs. Switching from DEPARTURE to ARRIVAL mode will transfer departure slots over to arrival slots. If you find a bug in the plugin or have any other questions regarging its use, please don't hesitate to contact us via the contact form. This page was last edited on 26 July 2014, at 15:10.